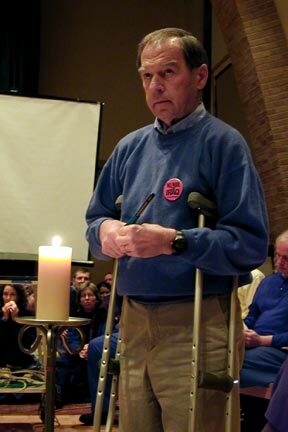 j o h n . . .
A faithful presence at the weekly Wednesday morning Alliant Vigil and the Bridge Peace Vigil in the afternoon, John was an active member of WAMM, the Twin Cities Peace Campaign, AlliantACTION, IPAC and Every Church a Peace Church. 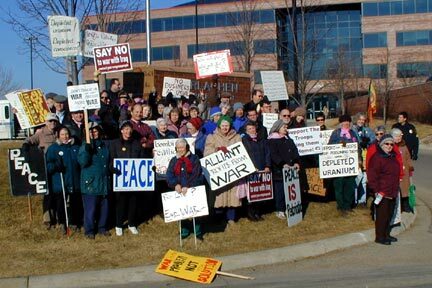 A retired teacher of the Minneapolis Public School system, John was an avid reader and researcher, studying issues in depth, and because of this, a great resource to the peace community on Iraq, depleted uranium and other issues. 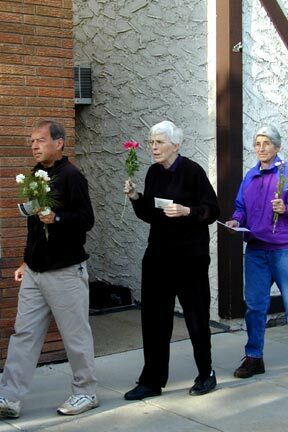 In 2002, John traveled to Iraq with Voices in the Wilderness making a statement against the punitive sanctions on Iraq and to witness firsthand the suffering of the Iraqi people. 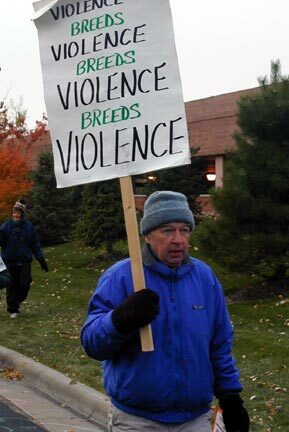 He was a regular Monday volunteer at the WAMM office and was always ready to give of himself for peace on earth. John will be remembered for his great heart, quest for the truth and gentle, unassuming manner. We will all miss him dearly as our thoughts and prayers are with JoAnn and their children, Jeremy and Annie. John passed away early Monday morning as a result of a sudden and acute case of liver cancer. He was surrounded by his loving family. He had been diagnosed with cancer only three weeks earlier.  excerpts from various sources. This image was taken just after being arrested, ticketed and released at Alliant Techsystems corporate headquarters. 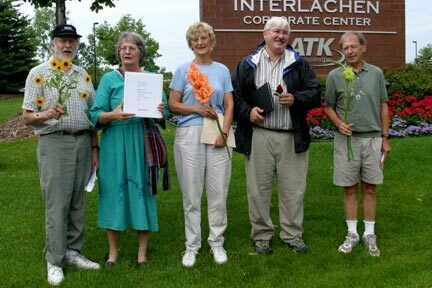 The group, (left to right) John Braun, Carol Masters, Marie Braun, Steve Clemens and John, had attempted to deliver to Alliant Techsystems (ATK) management a document on employee liablities under international law. ATK refused to accept the report and the group refused to leave Alliant property. John is about to be interviewed by a Japanese television network filming a documentary on Depleted Uranium (DU). 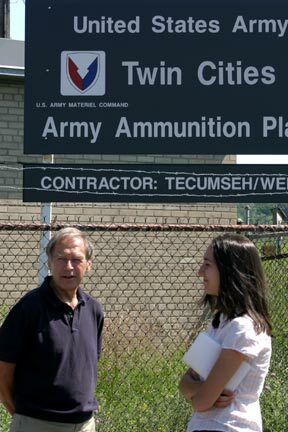 ATK produced over sixteen million rounds of DU shells in Building 502 at theTwin Cities Army Ammunition Plant (TCAAP) in Arden Hills. He is consulting with the producer prior to the filming. One week later, he would be arrested at ATK's corporate headquarters in Edina for trespassing. At the front gate of TCAAP with Amy Kommatas of TV Asahi - Japan. 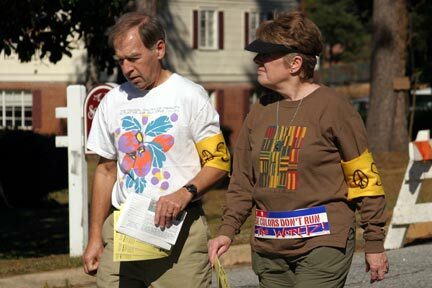 John was chosen as AlliantACTION's spokesperson for his extensive knowledge and research of depleted uranium. ATK and the U.S. Army declined to be interviewed for the documentary. 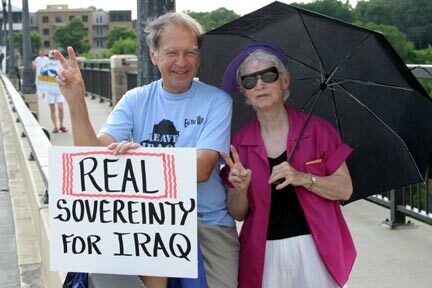 John with Kate McDonald at the weekly Bridge Vigil to End the War and Occupation of Iraq. 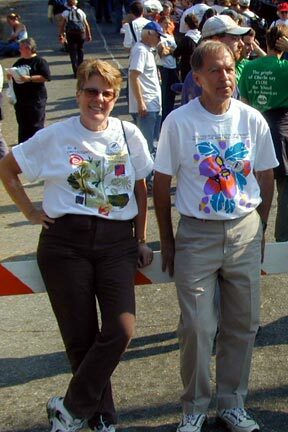 John and Kate have both been involved with the Twin Cities Peace Campaign since its beginning. 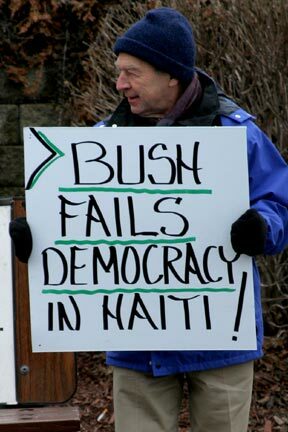 Outside Senator Norm Coleman's St. Paul office the day after the U.S. sent troops to Haiti. Part of the welcoming committee at the Annual Shareholders meeting at ATK, John is on the far right. His sign reads: Stop DU  the New Agent Orange. 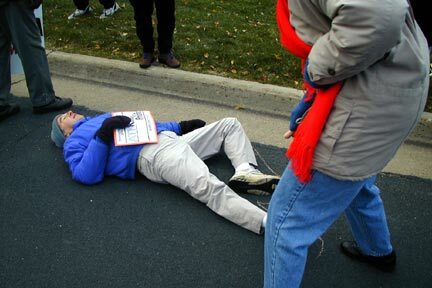 John is outlined in chalk on the road in front of Alliant's headquarters as "collateral damage" at an action asking "Who Profit$? Who Dies?" at ATK. JoAnn and John in Columbus Georgia at the School of the Americas Watch Vigil. Both shared their committment to nonviolence as SOAW peacekeepers at the annual gathering. Lighting the Candle of Hope at the Feast of the Holy Innocents, held for the children of Iraq. Early on the first day of the gathering, John's foot was run over by a car! He and JoAnn spent the weekend in a Columbus Georgia hospital emergency room and then their hotel room. Evidence of the adventure (?) is the picture above with John on his crutches. JoAnn and John in Columbus Georgia at the School of the Americas Watch Vigil. 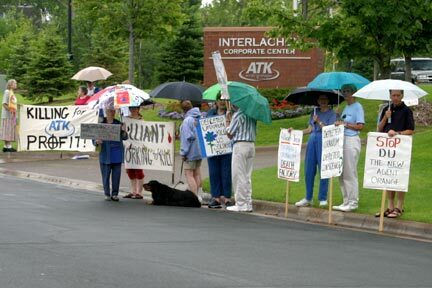 The final demonstration at the Hopkins site of ATK. Within a month, the company moved its headquarters one mile away to Edina. The theme was "Farewell to Arms" where we planted seeds of HOPE. John is pictured above on a one mile walk from Downtown Hopkins to Alliant headquarters with Betty McKenzie, CSJ and Rita Corcoran. 65, of Bloomington, passed away Sept. 6, 2004 after a one-month struggle with cancer. 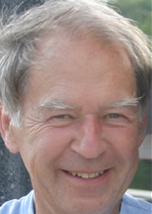 He was a dedicated math teacher who retired from the Mpls Public Schools after 30 years of teaching. John was a spiritual leader and a full-time activist with a strong commitment to peace, justice and humanity. Survived by loving wife, JoAnn; son, Jeremy; daughter, Annie; sister, Mary Lou (Ron) Peterson and many other relatives and friends. Funeral service 3 PM, visitation 1 PM Thursday, Sept. 9 at St. Stephen Lutheran Church, 8400 France Ave S., Bloomington.